All About the Muscadine Grape! The muscadine grape grows in the warm, humid, southeastern USA. This species of grapes has a tough, thick, skin. They range in colors from bronze, dark purple, to black when ripe. In the wild, deciduous muscadine vines grow 60 - 100 feet with small greenish flowers and loose grape clusters of three to forty a bunch. Inside the grapes are hard, oblong seeds. Many wild varieties can stay green through maturity. They ripen between mid September to late October. A mature vine can yield, approximately, twenty pounds of fruit. Muscadines can be eaten directly out of the hand or used to make jellies, jams, juices and wines. — The muscadine grape has an extra pair of chromosomes compared to the traditional grape. This is one reason it's known as a "super grape". These chromosomes produce a unique balance of phytonutrients, ellagic acid and natural resveratrol. — Ellagic acid plays a role in cancer prevention. It’s closely linked to anti-aging activities. — Muscadines have six times resveratrol, as traditional red grapes. Resveratrol is an antibiotic, produced by plants, to guard against infections or environmental stress. Plants are protected against bacteria, fungi, insects and harsh weather. Resveratrol is found in grapes, red wine, grape juice, peanuts, cranberries, blueberries and other fruits and plants. The content of resveratrol, in red wine, is higher compared to other foods or beverages. — Muscadines have antioxidants! The muscadine grape contains higher levels of antioxidants than blueberries, blackberries, blueberries, cranberries, raspberries or strawberries! Antioxidants attack damaging free radicals. Dangerous free radicals are unstable molecules that cause oxidation in the blood, leading to the onset of many diseases. Free radicals can speed up the aging process with the breakdown of collagen and reduced oxygen levels found in cells. They can cause wrinkling of skin, pre-cancerous and cancerous skin lesions. 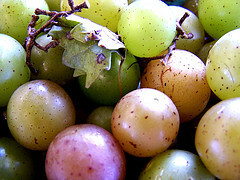 — Muscadine grapes are low in fat and sodium. They have healthy amount of potassium, fiber and vitamin C. The fiber is more than in oats. This is one reason they’re thought to lower cholesterol. A muscadine homemade soap will have a sweet, strong, grape-like scent. Muscadine wine and grape juice are additives to homemade soap recipes. Both items are available at stores carrying such drinkables. Muscadine, synthetic, fragrance oil does NOT have conditioning properties. You'll need to blend this fragrance with, conditioning and nourishing, soap making oils for skin care benefits. Just a drop or two is all that’s needed in a homemade soap recipe for a sweet, strong, aroma. Blend it with golden jojoba, coconut, soybean, castor, sweet almond or wheat germ oils. Frankincense is a nice complimentary fragrance. Learn how to make soap with soap recipes!